I just happened on the Bitly Media Map when researching their link shortening service to use as an example for thinking through some issues for my research. 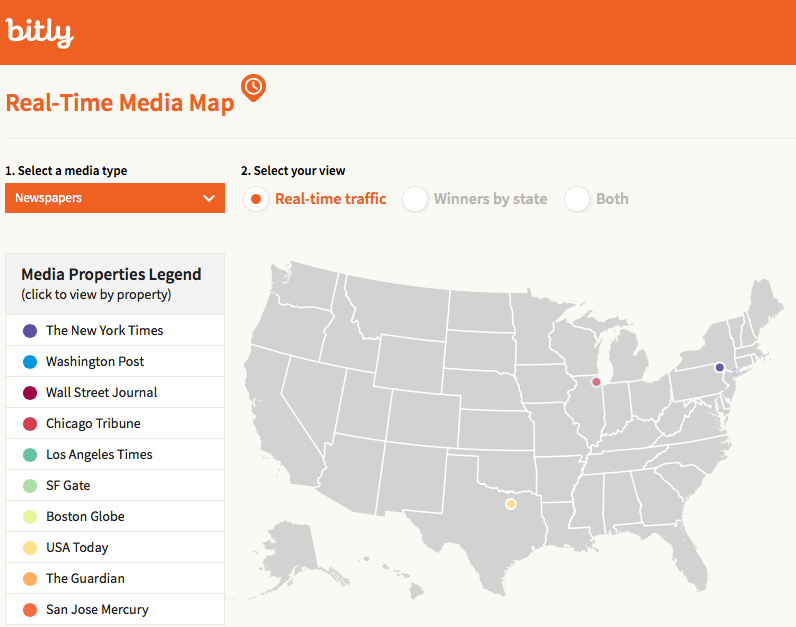 It is a map of the US that shows by location and in real time the media sources for links that people click on. The effect of the dots lighting up on the map is quite mesmerizing, kind of like a field full of fireflies on a summer evening. It also shows the US waking up. As I type this it is around 9am on the east coast and around 6am on the west coast; most of the activity is happening in the eastern part of the country, with a few early birds up and reading the news on the west coast (mostly around the Bay area). Of course the preferred news sources by location are interesting too. So lots of interesting things in this little visualization that provides an interesting perspective on the world.